I wish tenkara Radically Simple, Ultralight Fly Fishing had been written when I was starting out. Back then, very little information was available in English and the computerized translations of Japanese websites are really not very useful. Dr. Kevin Kelleher and Ms. Misako Ishimura (both tenkara anglers) have written an introduction to tenkara for American anglers. The book is an easy read, and at 133 pages, you will have gone through it a couple times before your new tenkara rod arrives in the mail. I say that because if you don't already have a tenkara rod, you'll want one before you finish the book. As an introductory work, which the first English language book on tenkara pretty much had to be, it covers a lot of different topics without going into extreme detail on any one of them. The origins of tenkara (at least to the extent they're known) are covered, as are the gear, the knots, techniques, flies, lines, backpacking with tenkara and tenkara for women. There isn't a lot on choosing a rod, but I have to say my own thoughts on tenkara rods have changed pretty radically since the book was published. Many of the fishing techniques outlined go beyond the scope of tenkara as practiced in Japan, but will resonate well with American anglers. I suspect most American anglers are a lot more concerned with how they can use a long rod with no reel on their own home waters than on how the Japanese fish the mountain streams of Japan. Split shot and woolly buggers may not be pure tenkara but you can bet they'll be used here in the US. If you have already spent many hours reading tenkara websites and blogs, have bookmarked the Google translator, and have a some time fishing with a tenkara rod under your belt already, most of what the book covers will not be new to you. If you are new to tenkara, though, having this book will save you a lot of those countless hours on the web. And while no book can completely replace on-stream experience, tenkara Radically Simple, Ultralight Fly Fishing will also help you get started on the stream. For those who are new to fly fishing as well as tenkara, the book has plenty of valuable information about such basics as the bugs fly fishermen try to copy and where in the stream you are likely to find the fish. Because tenkara is such a great way for someone to start fly fishing (or for someone who has given up because fly fishing seemed too complex), covering some of the basics is not a bad idea. 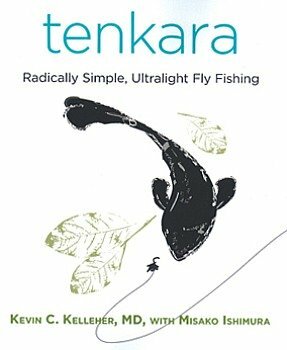 tenkara Radically Simple, Ultralight Fly Fishing is beautifully illustrated by Dr. Kelleher and Ms. Ishimura themselves.